Royal Enfield first introduced the Himalayan at the EICMA show back in 2016. Compared to the massive pavilions and runway models from hometown heroes like Ducati and the Aprilia/Moto Guzzi/Vespa team, the low key unveiling of the little Himalayan was on a pile of dirt… literally. However, the unveiling by Eicher Group CEO Siddhartha Lal and Pradeep Mathew, project leader for the new bike, proved to be a surprising show stopper. Their presentation of “the bike that conquers nothing” drew a laugh from the global journalists, but they were crowded 10 deep to see it. It seems the concept of an unassuming middle weight and ultimately versatile motorcycle resonated with the audience in Europe. Fast forward to 2018, and as this issue was press; U.S. dealers were taking delivery of their shipments of the 411cc “non-extreme machine,” as Royal Enfield North America president Rod Copes put it. 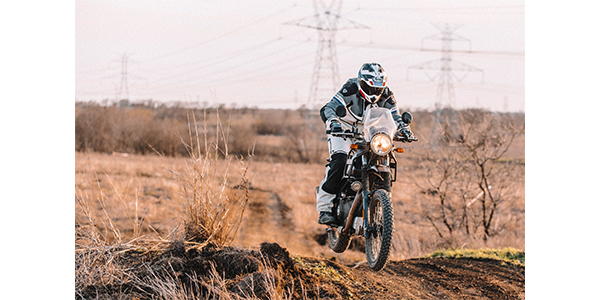 “In this era of extremely focused and niche marketed motorcycles, the Himalayan is definitely a throwback to an earlier era,” said Copes, the ex-Harley-Davidson executive. Despite his expertise in the heavyweight cruiser market, Copes was told to throw away The Motor Company playbook and approach Royal Enfield as a blank canvas. Mission accomplished with the Himalayan. Project manager Mathew joined Copes and the journalists at TexPlex in Midlothian, Texas, and reiterated that the bike was not purposely built to fit into a specific market niche for American consumer demographic gap… quite the opposite. Take the 31.5” seat height and ergonomics for example. “The point was to allow the average Asian person to be able to put his or her feet flat on the ground,” Mathew said. He also reiterated the ergonomic sync between foot pegs, handlebar and seat height; what makes it comfortable for all day riding while still making it agile enough to hop curbs and negotiate around-town traffic in India. The fact that the oversized pannier mounts double as sari guards further demonstrated this bike was not intended for the average American cruiser customer. The four gallon tank and 70 MPG provides a range well over 250 miles. The Himalayan was targeted at the home market, from the name to the EFI mapping curve. Not a bad strategy considering the fact that India has surpassed China as the number one powered-two wheeler market in the world. More than 48,000 units a day are sold in India. This helped make Royal Enfield the fastest growing motorcycle brand in the world. Back in 2010, more than 50,000 350cc and 500cc Bullets were built and sold. New facilities in Chennai in 2013 and another in 2017 boosted capacity to 850,000 units for 2018. While they are looking for “unconventional” dealers, Royal Enfield North America offers traditional support including flooring from Wells Fargo and retail finance from ThunderRoad Financial. Add in a healthy dealer margin and generous terms to support demo bikes and Royal Enfield dealers can not only reach new customers, but make money doing it. “Every dealership is different, but ideally, we would like for them to devote 500 square feet, display three to five bikes and have a demo unit,” Roark said. He had a model dealership set up in Texas to show some of the range of PG&A from the newest division of Royal Enfield. Royal Enfield Genuine Motorcycle Accessories (GMA) was established in 2017 at the company’s UK Tech Centre. The dedicated GMA development team is fully integrated into the OE vehicle development process. The Himalayan-specific accessories were carefully designed for function, comfort, utility and price point. Available accessories include, waterproof travel bags, engine guards, aluminum panniers, handlebars and more. It is this long-term view that recognizes the value of the U.S. marketplace for not only the Himalayan but bikes still on the drawing board.